The geothermal heat pump comes packaged in a single cabinet. 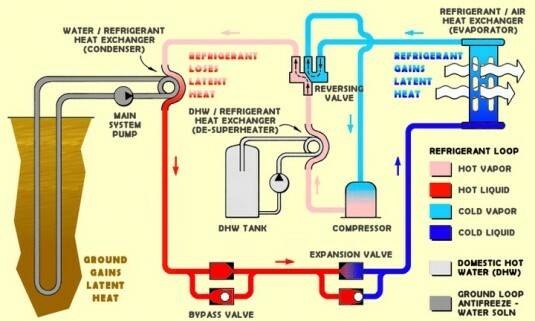 This includes the compressor, the loop to refrigerate the heat exchanger and the controls. The systems used to distribute the heat also contain the air handler, refrigerant to air heat exchanger and condensate removal system for the air conditioning. Many systems fitted in a residential site are installed today fully equipped with desuperheaters, which are used to provide hot water to homes when the system is providing heat or air conditioning. This desuperheater is a small auxiliary heat exchanger located in the compressor outlet. Its function is to transfer the excess heat from the compressed gas to a water line that circulates water to the hot water tank of the house. It is designed to provide less hot water during the winter and virtually none during the spring and fall when the system is not operating. The heat pump is the most efficient means of water heating than any other method. Therefore, the manufacturers have begun to offer even more service offering systems e.g. ‘triple function’ or ‘full condensing’ that are made to use a different and separate heat exchanger to meet all of the household hot water needs. All this is brought about by the healthy competition in the market. There are two main types of loops and they include the close loop and the open loop. The open loops are considered the simplest as they have been used so much over the years. The loops have proved effective with use because of their simplicity. However, nowadays the closed loop system is becoming the most common. When it is properly installed it has various advantages such as it is cost effective and an efficient, reliable method to use. The system of the closed loop is environmentally friendly because the water in the loop prevents contamination to the external environment. In installation, the horizontal closed loop installations are generally the most cost effective even though the vertical closed loop system is preferred in many situations. The geothermal heating and cooling systems can be connected to the ground or earth in many different ways, which have been all thoroughly proven in the field. However, if you need high performance then you are advised to utilize the help of experienced professionals who have the necessary skills and understanding. With their expertise you will know what method suits you best as they will help you decide the best system to install in your home.